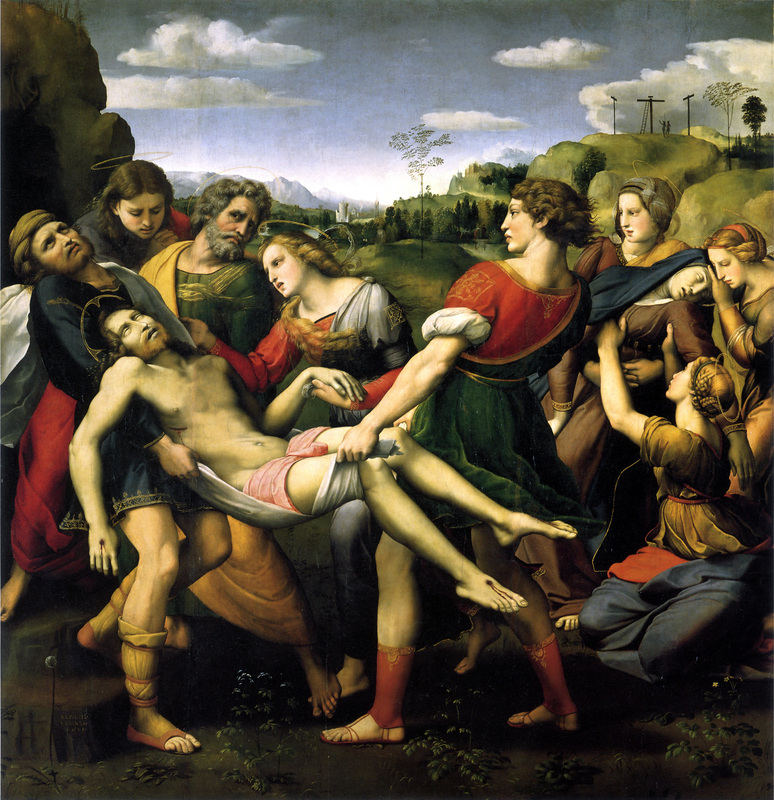 The very name of the Pre-Raphaelites, by referencing Raphael, evokes Italy and, of course, harkens back to art before the High Renaissance and Raphael’s followers. Much has been written about the Italian artists of the early Renaissance and late-medieval periods who inspired the Pre-Raphaelites — Botticelli and Fra Angelico were named specifically on the Brotherhood’s ‘List of Immortals’ — and there was an exhibition at the Ashmolean Museum in 2010 titled The Pre-Raphaelites and Italy which explored their connection and fixation with the country. But what about the Northern Renaissance and the artists of fifteenth-and-sixteenth-century Germany, France, the Netherlands and even Britain, and did they exert an influence on Pre-Raphaelite art? There is much evidence to suggest this is so, and this post is only the proverbial tip of the proverbial iceberg. The aforementioned ‘List of Immortals’, which was drawn up at one of the Brotherhood’s first meetings in 1848, is awash with Italian painters and poets; interestingly, the list contradicts the comfortable definition of Pre-Raphaelitism by including High Renaissance and Post-Raphaelite artists such as Leonardo, Michelangelo, Titian and Tintoretto. Even the Greek sculptor Pheidias gets a mention, further refuting the popular conception that the Pre-Raphaelites had no interest in the classical art exalted at the Royal Academy. However, amidst all these Italian figures there isn’t a single Northern Renaissance artist to be found. ‘Northern Renaissance’ is a blanket term which refers to the European countries outside (and therefore north of) Italy, that locus from which Renaissance thinking radiated all across the continent. Generally speaking (and prepare for some sweeping generalisations just to summarise) these northern countries remained in the shadow of the Middle Ages for much longer than Italy, and the prevailing style was medieval and Gothic as opposed to Italy’s revived classicism. 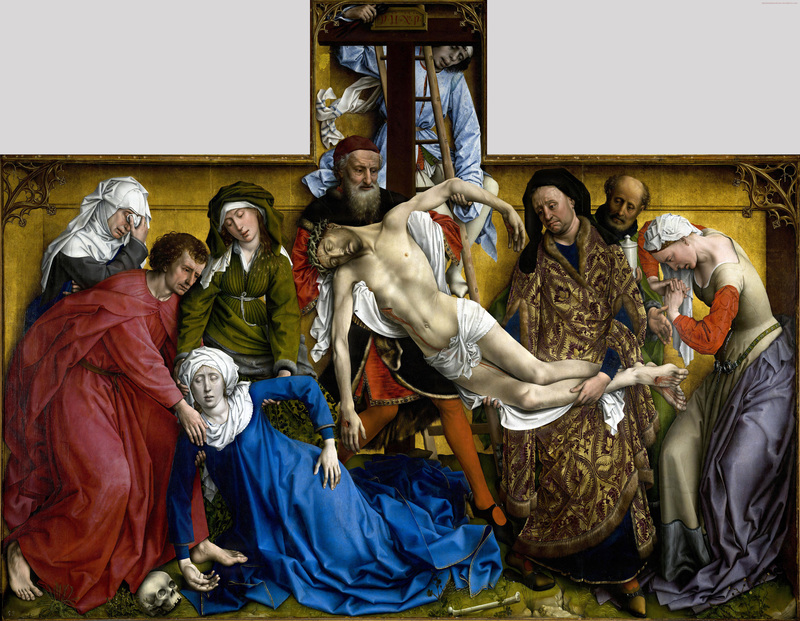 There is a definite difference in styles: compare, for example, the Flemish Rogier van der Weyden’s Descent from the Cross from 1435 with Raphael’s treatment of the same Biblical event (both below). The figures in the Van der Weyden are angular, stiff and unidealised, cramped into a very shallow space with Gothic architectural elements; Raphael, meanwhile, employs the classical, idealised bodily proportions and atmospheric, linear perspective typical of the High Italian Renaissance. The moods of the two paintings are also very different: Van der Weyden’s is quiet, melancholy and funereal — the figures weep actual tears — whereas Raphael opts for melodrama and dynamism, with a milder sense of sorrow in comparison. The faces in Van der Weyden’s painting are not like Raphael’s classical ‘types’; they could easily be individual portraits of actual people, painted from life rather than derived from antique statuary. Go to Nature with all singleness of heart and walk with her laboriously and trustingly, having no other thought but how best to penetrate her meaning, rejecting nothing, selecting nothing, scorning nothing. 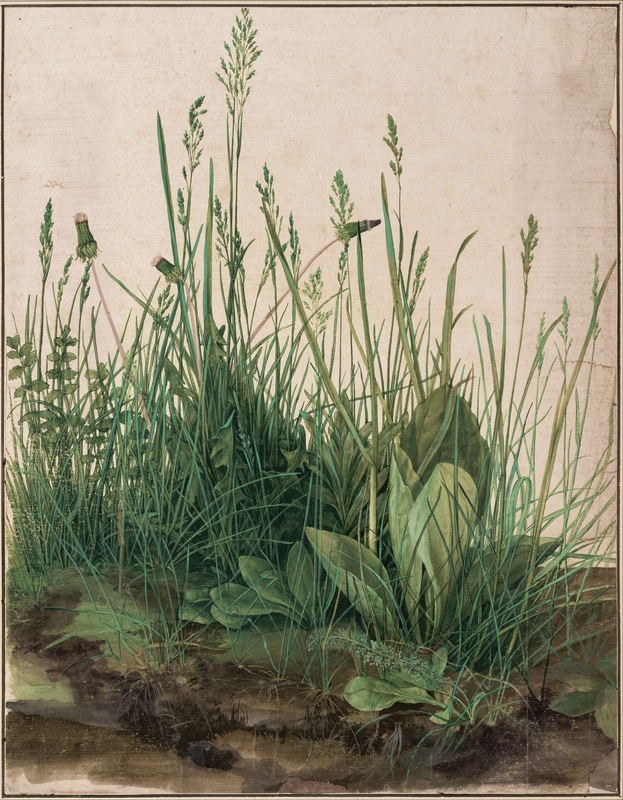 Nature should be followed and copied exactly and authentically, not idealised and prettified — an artist should be selective, but should paint or sketch every leaf, every petal, just as Dürer did. 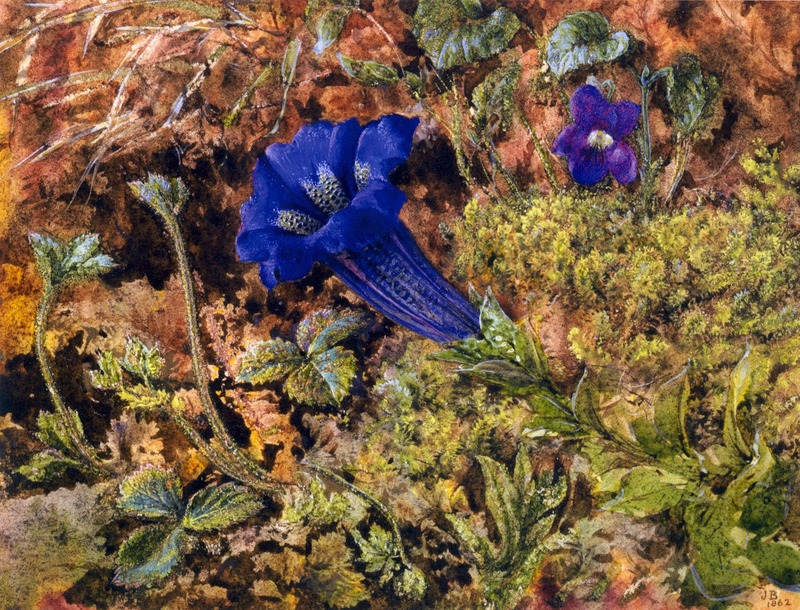 Although, as some have remarked, Dürer’s watercolours might have been an attempt to subtly perfect nature, and that he might actually have been very selective about what he chose to paint and what he omitted from his composition. 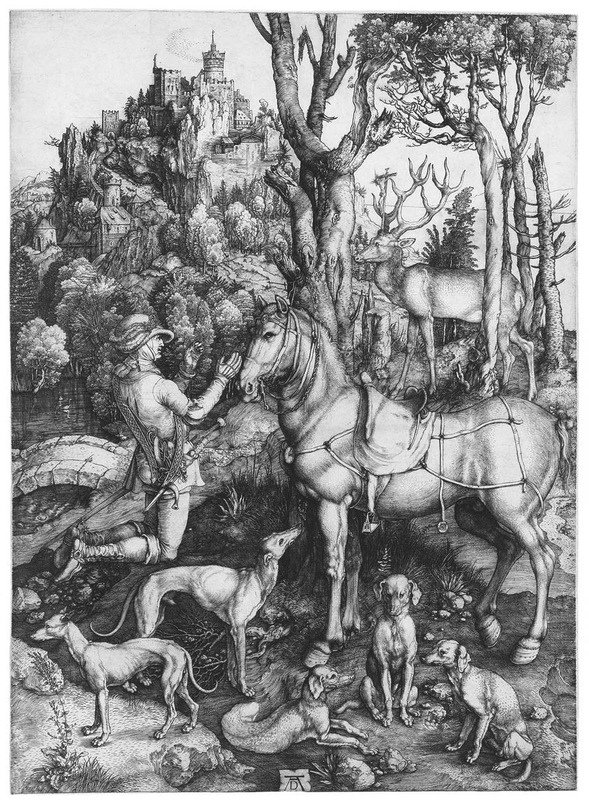 This Pre-Raphaelite interest or awareness of Dürer also carries over into drawing and printmaking. When I first visited Kelmscott Manor, I was pleasantly surprised to discover several of Dürer’s gorgeous Apocalypse woodcut prints hanging in the upstairs rooms — it turns out that William Morris was an avid Dürer fan and had collected his prints at some point. I got the impression that, for Morris and his medievalist friends, Dürer signified something else besides truth to nature: his woodcuts and engravings evoked the medieval past and the strange, Gothic imagination of the Middle Ages; their archaic oddness and dark, craggy, arboreal settings probably felt closer to home, to England, than the sultry, Arcadian, remote vistas of Italian painting. 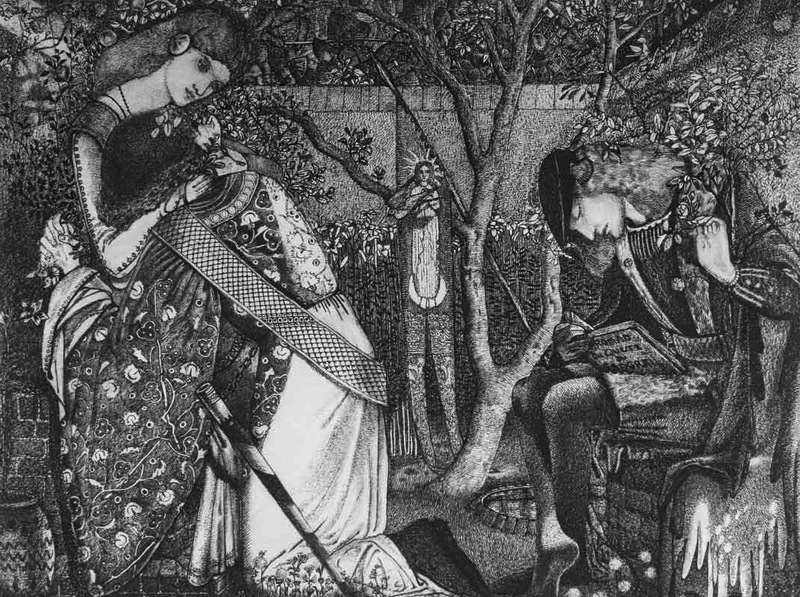 Edward Burne-Jones shows an awareness of Dürer’s prints during his Oxford days in his exquisite pen-and-ink drawing from 1858, The Knight’s Farewell. After first meeting Burne-Jones in Oxford at this time, Dante Gabriel Rossetti wrote to William Bell Scott: ‘Jones’s designs are marvels of finish & imaginative detail, unequalled by anything except perhaps Albrecht Dürer.’ The fine, silvery quality of Burne-Jones’s drawing matches the detailed tones of Dürer’s etchings, engravings and drypoints (such as St Eustace, below). Colin Cruise also notes that the prints of Frederick Sandys were admired by fellow Victorians for their continuation of Dürer’s style. Joseph Pennell, another nineteenth-century printmaker, considered Sandys ‘in imaginative power, the greatest of all…in technique he is the legitimate successor of Dürer’, and that ‘in every one [of Sandys’s designs] is seen the hand of the man able to carry on the tradition of Dürer, and yet bring it into line with modern methods’. 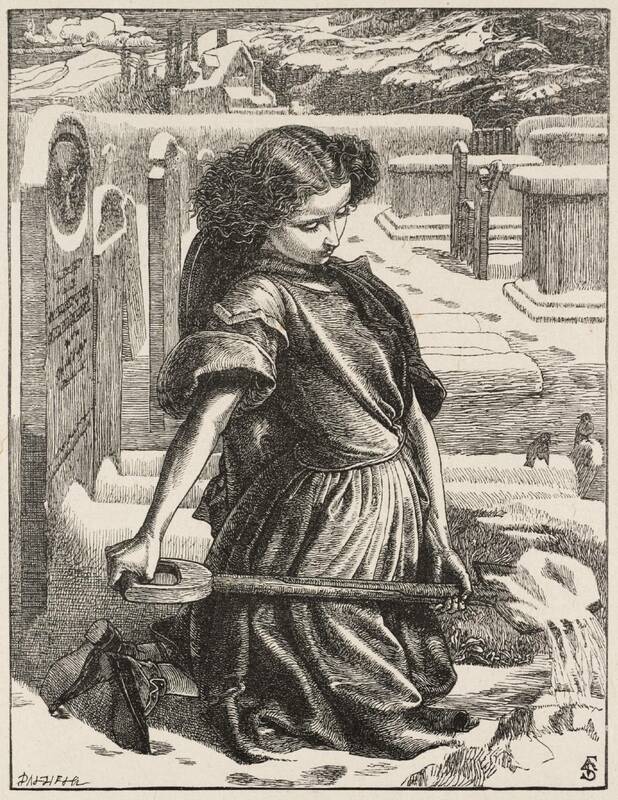 The shading and texture of, for example, Sandys’s The Little Mourner (below) does indeed suggest the influence of Dürer, particularly also the cold, mournful setting. 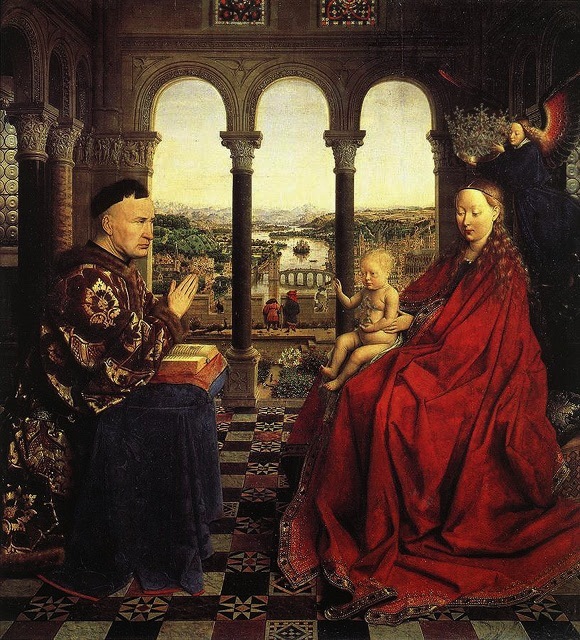 Another Northern artist whose work the Pre-Raphaelites would certainly have been familiar with is Jan van Eyck, whose famous Arnolfini Portrait entered the collection of the National Gallery in 1842. In 1849, too, Dante Gabriel Rossetti and William Holman Hunt visited the Louvre in Paris, where they would undoubtedly have seen Van Eyck’s Madonna of Chancellor Rolin (1435; below) with its gorgeous, jewel-like colours and high levels of detail. I’ve also always thought that there’s something of the melancholy, flowing-haired Pre-Raphaelite woman in Jan van Eyck’s portrayals of Virgins and angels in opulent, bejewelled settings, particularly in the meticulousness with which Van Eyck renders their soft, waving aureoles of hair. 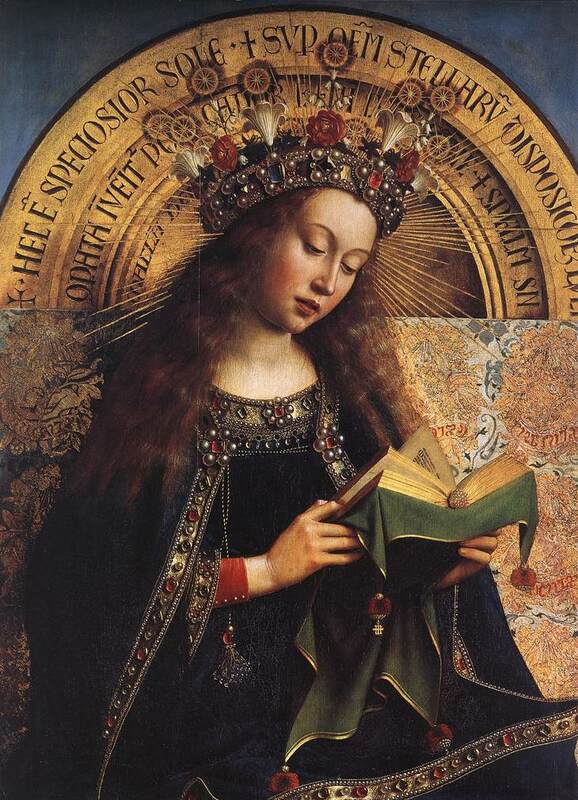 However, it’s probably very tenuous to compare the Virgin Mary from Van Eyck’s Ghent Altarpiece with Rossetti’s Fair Rosamund! 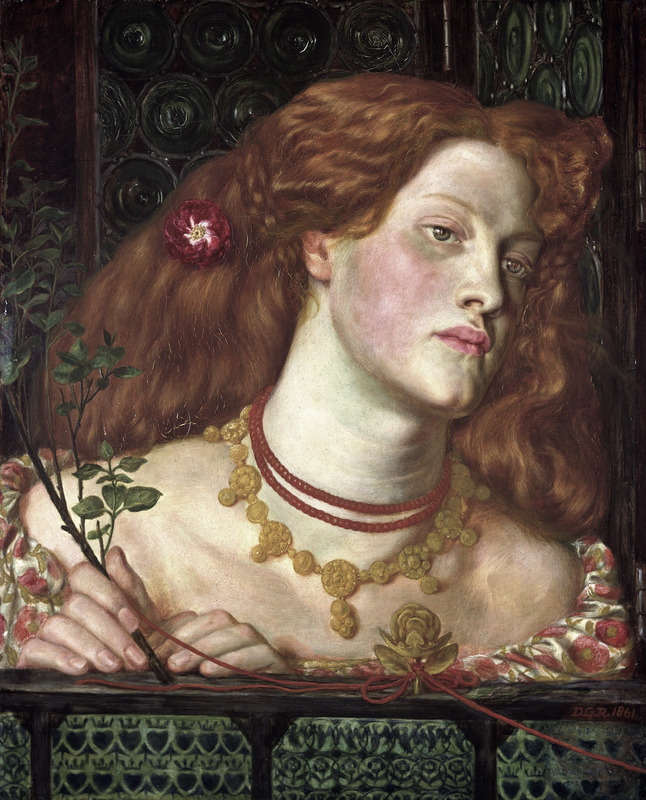 I had hoped to write a blog which succinctly summarises the Pre-Raphaelite connections with the Northern Renaissance, but in truth I’ve only scratched the surface. There are surprisingly few studies of the subject in PRB scholarship, and it becomes apparent that a full survey of it is needed. Something for the future, maybe? Smarthistory analysis of Albrecht Dürer’s The Large Piece of Turf on Youtube. Detailed article on ‘The Archaic Inspirations of the Pre-Raphaelite Brotherhood’ by Rebecca Nelson. Smarthistory discussion of Dürer’s prints on Youtube.